The GoFlo travelling water screen at the Cochwillan hydropower scheme. 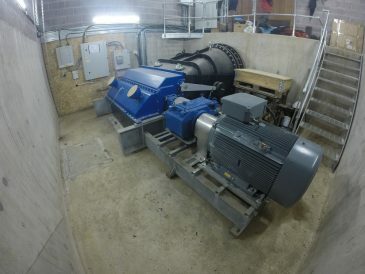 The Cochwillan hydropower scheme is an exemplar project demonstrating the benefits of combining hydropower with innovative water screening technology. Gloucestershire based Renewables First, who specialise in the feasibility, consenting, design and construction of low and high head hydropower systems throughout the UK and overseas, was hired by Carter Jonas land agents (acting on behalf of Penrhyn Energy Ltd) for their consultancy, design and installation procurement services for the hydropower component of the Cochwillan scheme. 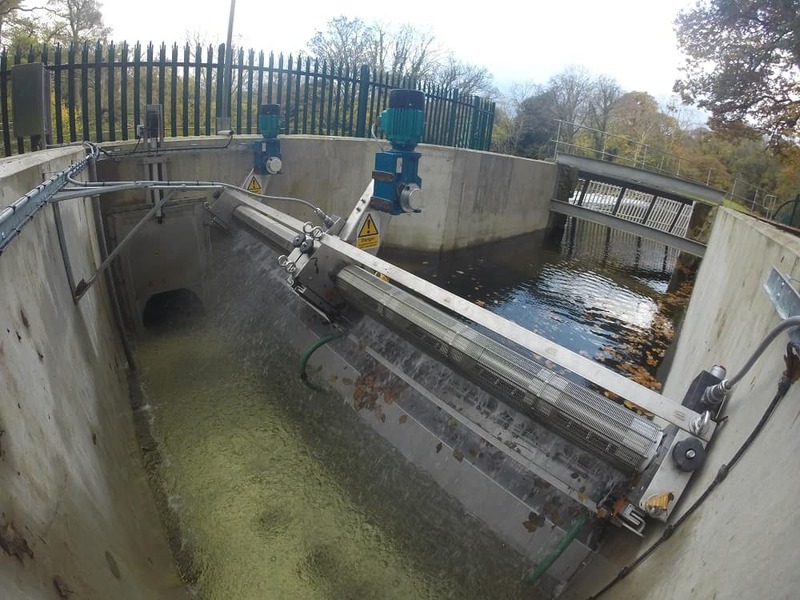 GoFlo Screens Ltd, a sister company of Renewables First, was commissioned to design, manufacture and install their innovative GoFlo travelling water screen, in order to meet stringent eel screening regulations and boost energy capture from the turbine. Working collaboratively, the two company’s project managed all stages of the scheme from feasibility, through to the design and consenting stages, installation and final commissioning. The 90kW Crossflow turbine at Cochwillan. The GoFlo travelling water screen at the hydro intake. The scheme is located in North Wales on the Afon Ogwen on the Penrhyn Estate, Cochwillan. The installation comprises a 90 kW Crossflow hydro turbine, exploiting a net head of 8 metres and a maximum flow rate of 1.59 cubic metres per second. The water intake is located adjacent to an old weir and the turbine is located on land within a natural meander of the river. 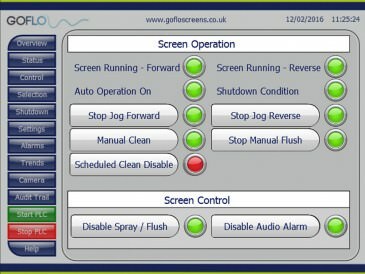 The GoFlo self-cleaning screen is located at the intake and is a modular system consisting of two screens located directly next to each other. With each of the two screens measuring 1.5 m in width by 4.5 m in length, the total screened area amounts to 13.5 m2. 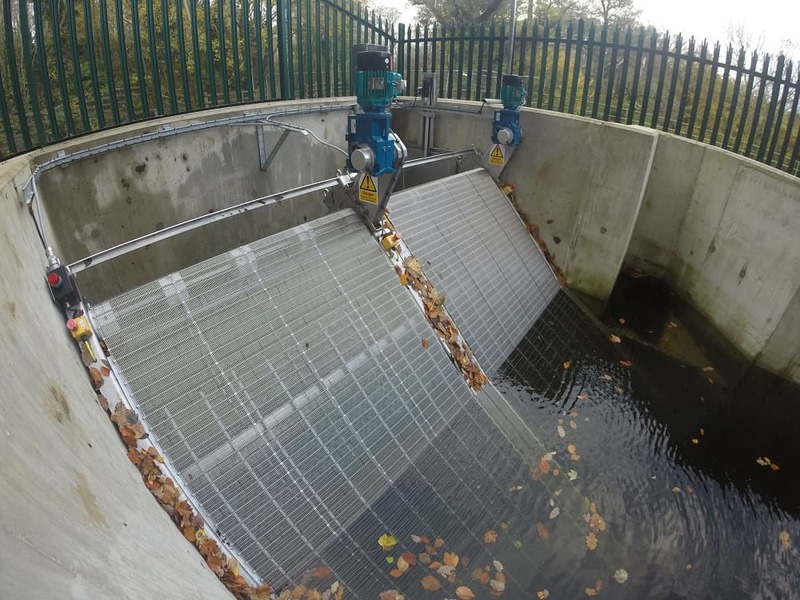 Given that the site is in close proximity to the sea, the water intake screen needed to comply with the strict screening rules under the Eel Regulations – hence a screen mesh with a 3 mm bar-spacing was specified. Why use a self-cleaning screen at this site? The Cochwillan GoFlo self-cleaning screen with very fine 3mm bar spacing for eel reg compliance. The requirement for a very fine screen mesh makes the Cochwillan site an ideal location for the GoFlo self-cleaning screen. In response to tightening eel screening regulations, manufacturers of water intake screens have developed ever-finer screen meshes in order to protect aquatic life. Whilst good for wildlife, ever-finer screen mesh requirements present a significant problem for hydropower systems because as the screens become finer they increasingly get clogged with debris which renders the hydro system inoperable or operating inefficiently. A GoFlo screen removing debris from the hydro intake area. Screen blockages and reduced flow are the primary cause of turbine downtime or poor performance at most hydro sites. Blocked screens lead to significant losses of income if they aren’t quickly unblocked. 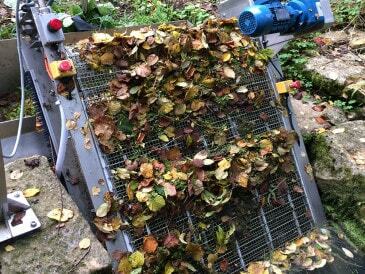 Intake screen-cleaning systems have been commonplace for years and come in a range of shapes and sizes, but they all begin to struggle as the bar-spacing reduces and ever-finer debris gets trapped and requires removal. Not so with the GoFlo screen. 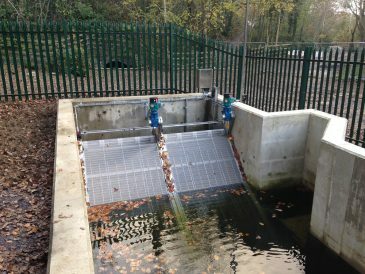 The GoFlo automatic self-cleaning intake screen ensures that you meet environmental regulations, such as the Eel Regulations, whilst also greatly increasing the energy yield and therefore hydropower income generated by your system. Combining hydropower technology with the GoFlo self-cleaning screen is a win-win situation. The annual energy capture of the Cochwillan scheme is calculated to be 487 MWh in an ‘average flow’ year, equivalent to powering 111 UK homes and producing an annual CO2 emissions saving of 243,642 Kg. Without the GoFlo screen, the energy capture would be significantly less. 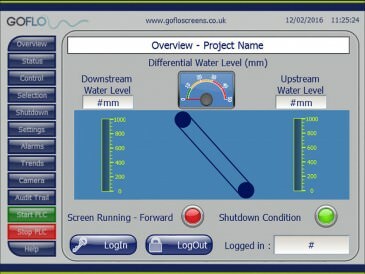 But what is it about the GoFlo screen design that makes it an attractive proposition for hydropower sites? As well as the economic benefits outlined above, the screens enable compliance with stringent fish and eel regulations. They offer long-term reliability and permanently clean operation. Screen maintenance requirements are straightforward and low cost. The screens are visually unobtrusive and are equipped with a remote monitoring and control system. Furthermore, the screens are easily installed using purpose-designed hinged (pivoting) mounting frames that are securely fixed to the concrete inlet structure. The screens are simply lowered into the pivoting frames from a vertical position. Once secure within the frames, the screens were then tilted to their specified running position. The motors used to power the screens at Cochwillan are located well above the level of the screen. However, they are fully rated to withstand full submersion in the event of flood conditions. Once installed and operable, the screen remains stationary until integrated pressure sensors on the upstream and downstream sides detect a head loss across the screen, which triggers a cleaning cycle. Clearing debris is achieved by the screen mesh rotating, pulling trapped debris out of the water and dumping it into a flushing trough on the downstream side. Debris that doesn’t freely fall off is blasted off with a spray boom that sprays outward from inside the mesh. Once debris is in the flushing trough, a pumped water supply which runs whenever the screen mesh rotates washes the debris down the trough back to the watercourse, downstream of the system. This is considered best practice for naturally-derived debris, because decaying leaves and natural debris comprise the base of the food chain in aquatic ecosystems. This all happens automatically and is tied into the control system. To see a GoFlo screen in operation, go to GoFlo TV. Example screen shot of the remote control function. The GoFlo travelling water screen can be controlled both manually (in-situ) or remotely. The scheme at Cochwillan incorporates the sophisticated GoFlo monitoring and control feature and includes a camera for remote viewing. The control and monitoring system is equipped with a mobile device web interface, meaning that it can be controlled from anywhere. The Cochwillan control system communicates purely via the 4G network so that it can be controlled remotely. A high quality day and night vision CCTV camera is installed overlooking your GoFlo screen. You can view this via the built-in web interface to allow you to check for problems that require addressing or just look at how well GoFlo is doing at keeping your intake screen free of debris! All critical alarms show in the web interface and can also be emailed automatically to email address embedded into the system, or sent to your phone via an SMS message. As an extra option, the GoFlo team can also monitor your system for critical alerts and take any action necessary to clear the alarms. “The team at Renewables First provided us initially with clear and concise review of a partially planned project providing an alternative design. Following approval and their appointment to the project we found the firm very reliable and all members of the team throughout the process easy to work with, and they worked well alongside independently appointed civils contractors. If you are at the design stages of a hydropower scheme or already an existing site owner, use the Additional Hydropower Income Calculator to determine the potential increase in income that could be achieved by using a GoFlo system. More generally, the use of GoFlo screens is not exclusive to hydropower systems. They can also be used in many other contexts, including agricultural and industrial abstraction, water utility works and power plants. You may also be interested in using the Pricing Calculator to give you an idea of the budget required. If this appeals complete the Measuring Up Guide and submit more details about your site.